The last twenty years have seen an unprecedented rise in the use of secret courts or ‘closed material proceedings’ largely brought about in response to the need to protect intelligence sources in the fight against terrorism. This has called into question the commitment of legal systems to long cherished principles of adversarial justice and due process. Foremost among the measures designed to minimise the prejudice caused to parties who have been excluded from such proceedings has been the use of ‘special advocates’ who are given access to sensitive national security material and can make representations to the court on behalf of excluded parties. Special advocates are now deployed across a range of administrative, civil and criminal proceedings in many common law jurisdictions including the UK, Canada, New Zealand, Hong Kong and Australia. This book analyses the professional services special advocates offer across a range of different types of closed proceedings. Drawing on extensive interviews with special advocates and with lawyers and judges who have worked with them, the book examines the manner in which special advocates are appointed and supported, how their position differs from that of ordinary counsel within the adversarial system, and the challenges they face in the work that they do. Comparisons are made between different special advocate systems and with other models of security-cleared counsel, including that used in the United States, to consider what changes might be made to strengthen their adversarial role in closed proceedings. 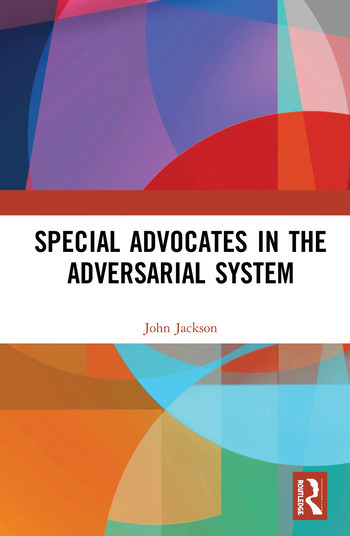 In making an assessment of the future of special advocacy, the book argues that there is need to reconceptualise the unique role that special advocates play in the administration of justice. John Jackson is Professor of Comparative Criminal Law & Procedure at the School of Law, University of Nottingham, UK and is a qualified barrister."